Our selection of night latches made by From the Anvil are the ideal solution to lock both interior and exterior doors. 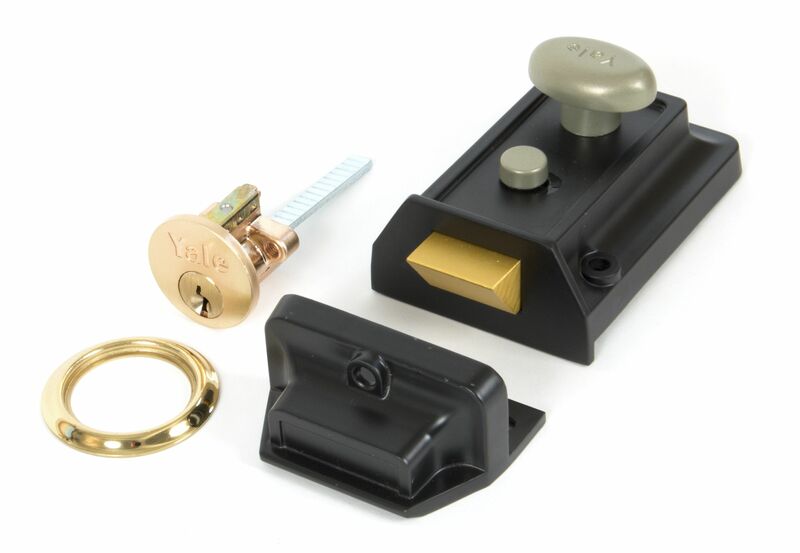 We supply both traditional case black nightlaches and modern case black nightlatches with the option of either a brass rim cylinder or a black rim cylinder. These night latches can be used for both inward opening doors and outward opening doors. Nightlatches and rim locks are ideal to be used as secondary security methods for front doors. Both door locks are installed on the surface of the door, unlike mortice locks which are fitted into the door. To completely secure a front door, we would recommend installing a mortice sashlock with either a night latch or a rim lock. To close wardrobe doors, cupboard doors or cabinet doors, we supply From the Anvil cupboard latches. Within this range, we have available beeswax cupboard turns, black cupboard turns, pewter cupboard turns and cabinet latches. Finally, we also have window security mortice bolts, which are sold with matching woodscrews and fixings. These mortice bolts require security star keys (sold separately) to be locked and unlocked.